Do you need to build a website for a new open access journal or is your current journal website in desperate need of an overhaul but you’re worried you don’t have the time, technical knowledge, or budget to do it? We have big news for you! Now you can create a professional journal website using Scholastica Open Access Publishing. You’ll get a modern website template designed specifically for academic journals that you and your team can customize and update yourselves using a simple editor tool. So you can set up a website to meet the needs of your journal in minutes without having to dig up thousands of dollars to pay a web developer or spend hours trying to do it yourself. There’s a lot more that goes into building a journal website than meets the eye, from working with Google Scholar to get approved for indexing to creating a mobile-friendly website layout so readers can access your articles across multiple devices. We know that journal teams have limited time and money for online publishing - that’s why we’ve made it easy to set up a beautiful journal website and host it on Scholastica. Ready to build a custom open access journal website on Scholastica? Sign up to receive more information! Scholastica’s journal website template gives you the ability to adjust your website header and color scheme to make it your own. To change your website’s background color, just select a valid hex code for the color you want. You can find tons of hex codes online, like at HTML Color Picker. Your journal website template will automatically adjust the color of the text on the page to complement your chosen background. You can also upload a journal cover image or logo to your website and adjust its size and positioning. Once you’ve customized your website layout and added your journal’s branding, you can easily add text to the website template pages, which we designed with intuitive navigation to give researchers the best possible user experience. To add text to your website pages, just click on the area you want to edit and start typing! Use our simple markdown editor to format the text on your pages. Your team can manage all aspects of your journal from peer review to publishing in one place with Scholastica. Our publishing software is seamlessly integrated with our peer review software, so journals that use both will be able to move accepted manuscripts from peer review straight into publishing without having to switch systems, re-upload accompanying files, or re-input metadata. All of the files and metadata that you apply to manuscripts in peer review will be automatically applied to the article creation page. All you have to do is upload your formatted article PDF and press publish. Using Scholastica, you’ll be able to give your journal’s readers a more engaging browsing experience. 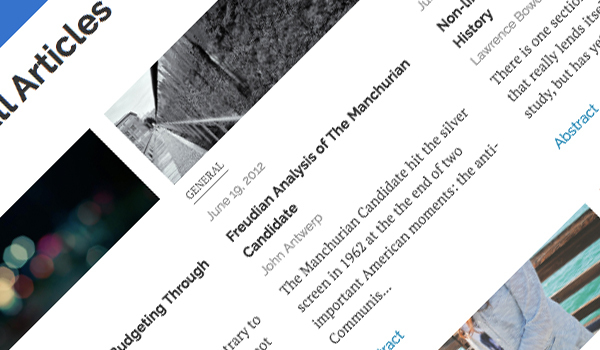 You can help readers find articles in a particular topic area by grouping your articles into custom sections. For example, you might have article sections for “original research” and “book reviews.” When you publish articles on your custom journal website you’ll also get to select an image to accompany each one. You can either upload your own images or use our included image gallery. Tip: When uploading images be sure to choose the right size to avoid distortion and pick an image that complements the specific article it accompanies. You can either choose a related photo or geometric patterns to accent each article listed. Additionally, you’ll have the option to add a blog to your website. Blogging is a great way to keep your website content fresh in-between publishing new articles and issues and to engage readers with shorter more conversational content. Many journals blog about their latest articles and publication news. You can add images to blog posts and even embed gifs and videos in posts! When you use Scholastica to publish your open access journal, you don’t have to worry about the technicalities of making your website mobile- or search-engine friendly. We do all of that for you. All Scholastica journal websites feature a responsive design that works on desktop, tablet, and mobile devices. Additionally, all websites have machine-readable metadata so that popular search engines like Google and Bing are able to crawl them and show relevant pages in search results. We’ve also set up automatic Google Scholar indexing for articles published via Scholastica Open Access Publishing, so all of your articles will show up in Google Scholar searches with no work on your part. Ready to create your journal website?